Please visit our Letters page to download a letter to parents concerning the inspection of Local Authority schools for SEN provision. During the Advent Mass at the end of term (2016) St George pupils were presented with prizes for the Knights of St Columba national prayer and essay competition. Prayer Competition Winner – Year 7-9 (12-14 y.o.) – Katie Bignell who was 1st at local and provincial level and 2nd Nationally. Prayer Competition Winner – Year 10-13 (15-18 y.o.) – Ben Orchard who was 1st at local and provincial and National Winner. Essay Competition Winner – Year 7-9 (12-14 y.o.) – Michael Thomson who was first at local and provincial and National Winner. This outstanding display is the best in the College's history and is further proof of the Holy Spirit at work. St George celebrated its most successful year for achievement with both our attainment and progress making us one of the most successful schools in the country. This was further confirmed by our recent Local Authority Inspection which graded us outstanding in all areas. The college continues to strengthen with more than 400 families choosing St George as a preference for admission in 2017, with over 200 being their first preference. This has been a long term project; ten years ago first preferences were 50 students for 150 spaces. I would like to pay tribute to the governors, staff and students who have all worked hard and believed in the transformation of St George. 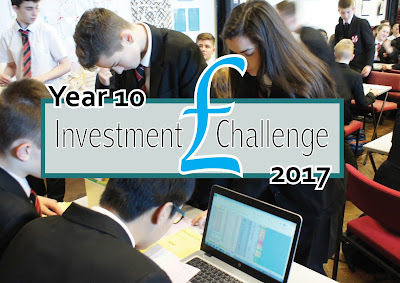 Year 10 gained some knowledge of the stock exchange in our Investment Challenge activity on January 11th. Click on the image to view photographs. Advisory information is posted on this page in the event of extreme weather conditions.